Combine surfboarding, skateboarding and biking… sounds impossible, outrageous and oh, so fun! A talented inventor, John, came to Davison with a rough model of a scooter concept, which various manufacturers had passed on, saying that it couldn’t be mass produced. John thought it could be; and, he was right. Davison not only mass produced John’s idea, but, developed it into a full-blown product line. 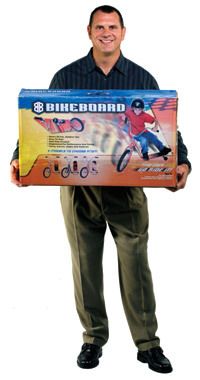 This “skateboard/bicycle” hybrid won an Industrial Design Excellence Award (IDEA) from the Industrial Designers Society of America, and was featured in BusinessWeek magazine.